Dutch garden designer Piet Oudolf, known for large public projects like New York's High Line, has completed a project much smaller in scale: a private terrace for an apartment building in the city. Oudolf conceived the planting scheme for the terrace atop the 57-unit luxury apartment building the Huys – Dutch for "house" – located in New York's NoMad neighbourhood. The former office building was converted into residential units last year with interiors by Dutch designer Piet Boon and was developed by the prominent Dutch real estate firm Kroonenberg Groep. Oudolf collaborated with Boon, a friend, to design the 2,900-square-foot (270 square metre) rooftop terrace, which is shared by residents. His aim was to create a space where people feel "happy" – a goal for all of his projects, he told Dezeen. "Whether it's a large landscape or just a small garden, I want to create a certain ambiance where people feel happy," he said. "That's what I'm trying to achieve." Oudolf is associated with the New Perennials – a design movement that promotes naturalistic landscaping over traditional, highly manicured gardens. "Even if space is very small, I try to make something very good that is not just decorative," Oudolf said. 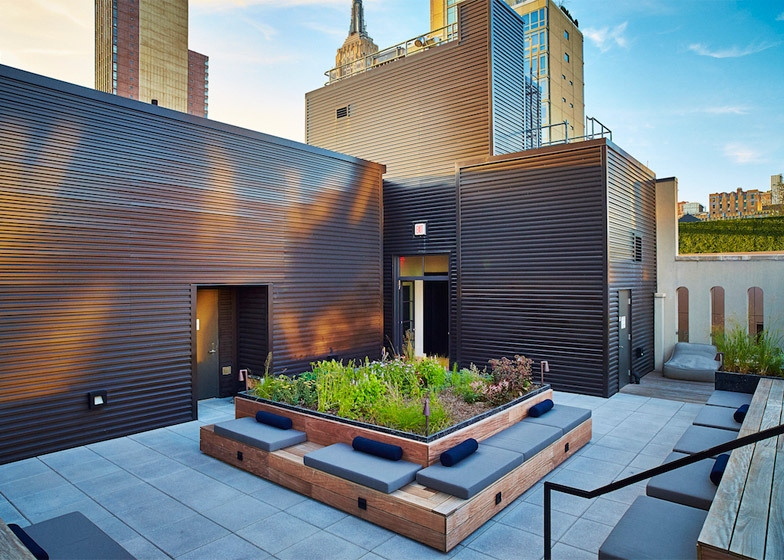 The Huys rooftop features four zones, each with a fibreglass planter filled with herbaceous perennials, ranging from flowering plants to sturdy grasses. "The planters help frame each of these areas, allowing one to experience a bit of nature throughout the entire roof terrace," said Oudolf. "When you are there, you are in and among the plants." The lower-level "piazza" serves as the entry zone and has a large planter bordered by a wooden bench. A "corner lounge" features a large chaise lounge, and the "border area" contains additional seating, including furniture designed by Boon. The "dining area" has an outdoor kitchen, along with tables and chairs – all covered by a wooden pergola. The terrace's decking is made of concrete pavers and Ipe wood. Oudolf said he is currently working on projects of varying scales, from hotel rooftops in Germany to a private garden in New York. His portfolio includes significant public projects such as the High Line and Battery Park in Manhattan, and the Lurie Garden in Chicago's Millennium Park. He also designed the interior garden for the 2011 Serpentine Pavilion in London by Peter Zumthor. Oudolf founded his practice more than 30 years ago and is based in Hummelo, the Netherlands. Photography is courtesy of Paul Barbera.